Sam Hamill is well-known to poets and appreciators of poetry. He is the author of more than forty books, including sixteen volumes of original poetry (including Measured by Stone; Almost Paradise: New & Selected Poems & Translations; and Habitation: Collected Poems); four collections of literary essays, including A Poet’s Work and Avocations: On Poetry & Poets, and more. He co-founded, and for thirty-two years was editor at, Copper Canyon Press, taught in prisons for fourteen years, and has worked extensively with battered women and children. He is also known to the anti-war community for having declined an invitation to the White House in 2003, and instead, founded Poets Against the War and compiled the largest single-theme poetry anthology in history, 30,000 poems by 26,000 poets. His awards are too numerous to list. Sam Hamill resides in Anacortes, Washington. Christopher Yohmei Blasdel is a shakuhachi performer, researcher and writer specializing in the music of Japan and Asia. A native of Texas, Blasdel has lived in Japan since 1972. Blasdel is the senior artistic advisor to the annual Prague Shakuhachi Festival, co-organized the Boulder World Shakuhachi Festival in 1998, and the World Shakuhachi Festival in Sydney in 2008. He was featured in the Sarawak Rain Forest Music Festival in 2004 and numerous other festivals and concert tours introducing Japanese music to the world. 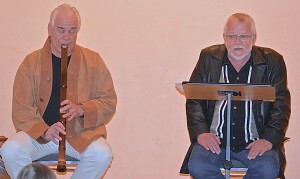 To date he has made a total of eight CDs of classical and contemporary shakuhachi music and has added shakuhachi music to live readings of many distinguished poets, including Sam Hamill. Hawai`i shakuhachi aficionadoes may know him for his many collaborations with Riley Lee, who regularly performs in Hawai`i. Now you’ll probably ask why they’re performing at Revolution Books instead of at the Blaisdell Auditorium. We don’t know, but when Christopher called to ask us if we’d like to host this event, we jumped at it. Books and CDs will be available at the reading.